This paper attempts to apply the implications of the grammaticalization theory to the Russian prepositional system. Special attention is given to reconstruction of the grammaticalization path "noun à preposition" (example – evolution of Russian prepositional unit лицом к лицу с кем-чем ‘face to face with smth.-smb.’, ‘facing smb.-smth.’) and to design of a grammaticalization scale for 8 prepositional units including somatic noun глаз ‘eye’ on basis of their grammaticalization level determined. Keywords: morphological category, singular, plural, ideation, mentalization, identification. The research of grammaticalization within Russian prepositional system is a very actual problem, because it allows viewing the category very broad as including all the units serving a formal, grammatical function simultaneously evaluating the stage of their grammaticalization. Thus new prepositions are revealed and attributed in the project "Slavic Prepositions in Synchrony and Diachrony Aspects: Morphology and Syntax". The purpose of the paper is to study paths and stages of grammaticalization within the prepositional field in Russian language. It also concerns with a new approach to functional parts of speech, particularly the prepositions. To achieve the objective it seems necessary to analyze Russian prepositional units in order to define their place on grammaticalization scale and to show the possible grammaticalization paths. The novelty of the paper is defined in synthesis of the grammaticalization theory implications and broad interpretation of prepositional units in Russian, which allows to analyze units serving grammar function and to define a degree of their grammaticalization. Theoretical value of the analysis corresponds with obscure problem of grammaticalization process within Russian prepositional system and with broadening of the modern views to prepositions as a category. Solving of above-mentioned theoretical problems has practical implications for lexicography, machine translation and Russian as a foreign language teaching. The units proved to be proper prepositions are suggested to be included in lexicography practice e. g. for dictionaries as new prepositional articles. First of all, it has been pointed out that grammaticalization process is very active in Russian within prepositional system. We expect to find the same process in other semantic groups especially in the ones of somatic nouns. The conclusion can be transferred to Russian prepositions as a category – it is assumed to be a very rapidly replenished class. Second, on the basis of one grammaticalization path discussed in the paper we can identify the grammaticalization channels peculiar to prepositional unit and enlighten the active process in the sphere which is very significant for drawing attention to the considerable changes in Russian prepositions as a category. Third, our study has identified the grammaticalization level of 8 prepositional units in Russian language which allowed us to construct a grammaticalization scale for these units. It offers a great potential for analysis and synthesis of the items in question. The material of the paper thus has implications for Russian language as foreign studying, machine translation and lexicography practice. The problem of grammaticalization within Russian prepositional system requires future research concerning with the following topics: 1) a thorough study and description of Russian prepositional units, particularly the ones including somatic nouns; 2) a determination of their grammaticalization level in view of proper lexicographic interpretation; 3) a revealing and providing extra reliable means for distinguishing the grammaticalization stages. ► This paper attempts to apply the implications of the grammaticalization theory to the Russian prepositional system. ► Special attention is given to reconstruction of the grammaticalization path “noun à preposition” (example – evolution of Russian prepositional unit лицом к лицу с кем-чем ‘face to face with smth.-smb.’, ‘facing smb.-smth.’) and to design of a grammaticalization scale for 8 prepositional units including somatic noun глаз ‘eye’ on basis of their grammaticalization level determined. Keywords: grammaticalization, grammaticalization path, grammaticalization scale, Russian preposition, prepositional unit, somatic noun. Vinogradova, Ye. N., & Chekalina, V. L. (2013). Takiye raznyye glaza… Predlozhnyye yedinitsy, vklyuchayushchiye leksemu glaz/glaza (zarisovki na materiale slavyanskikh yazykov). Yazyk, soznaniye, kommunikatsiya, 47, 103-122. Vsevolodova, M. V. (2011). K voprosu ob operatsionalnykh metodakh kategorizatsii predlozhnykh yedinits. Vestnik Moskovskogo universiteta, 2, 103-135. Vsevolodova, M. V., & Kukushkina, O. V., & Polikarpov, A. A. (2013). Russkiye predlogi i sredstva predlozhnogo tipa. Materialy k funktsionalno-grammaticheskomu opisaniyu realnogo upotrebleniya: Vvedeniye v obyektivnuyu grammatiku i leksikografiyu russkikh predlozhnykh yedinits. M.: "Editorial URSS". Zahnitko, A. P., & Danyliuk, I. H., & Sytar, H. V., & Shchukina, I. A. (2007). Slovnyk ukrayins'kykh pryymennykiv. Donets'k: TOV VKF "BAO". Kanyushkevich, M. I. (2008-2010). Belaruskiya prynazoўnki i ikh analagi. Gramatyka realnaga ўzhyvannya. Materyyaly da sloўnika. Grodna: GrDU. Konyushkevich, M. I. (2010). Somatizmy v funktsii predloga (K voprosu o granitsakh kategorii personalnosti). Linhvistychni studiyi, 20, 79-86. Podlesskaya, Rakhilina: Podlesskaya, V. I., & Rakhilina, Ye. V. (2000). "Litsom k litsu". Logicheskiy analiz yazyka: Yazyki prostranstv, 98-107. M.: "Yazyki russkoy kultury". Slavyanskite, (2007). Slavyanskite predlozi. Veliko Trnovo: IVIS. Sheremetyeva, Ye. S. (2008). Otymennyye relyativy sovremennogo russkogo yazyka. Semantiko-sintaksicheskiye etyudy. Vladivostok: Izd vo Dalnevostochnogo un-ta. Shiganova, G. A. (2001). Sistema leksicheskikh i frazeologicheskikh predlogov v sovremennom russkom yazyke. Dis. … d-ra filol. nauk. Chelyabinsk. Heine, B., & Kuteva, T. (2002). World lexicon of grammaticalization. Cambridge: Cambridge University Press. Hopper, P. J., & Traugott, E. C. (2003). Grammaticalization (second edition). Cambridge: Cambridge University Press. Lehmann, Ch. (2002). Thoughts on grammaticalization: a programmatic sketch (second edition). Arbeitspapiere des Seminars für Sprachwissenschaft der Universität Erfurt (Heft 9). Erfurt: Seminar für Sprachwissenschaft der Universität. Svorou, S. (1993). The grammar of space (Typological studies in language: Vol. 25). Amsterdam: John Benjamins. Ekaterina N. Vinogradova, PhD in Linguistics, Associate Professor at Department of Russian as a Foreign Language for Humanities in Lomonosov Moscow State University. Her areas of research interests include Russian functional grammar: syntax, morphology, prepositional system and distance learning of Russian as a foreign language..
Over the course of the last decades, a great amount of data has been published on the grammaticalization theory [Lehman 2002; Hopper, Traugott 2003], which concerns with its sources and channels studies, its word lexicon creation, semantic maps construction and a wide range of typology researches. The observations executed during the research in the project "Slavic Prepositions in Synchrony and Diachrony Aspects: Morphology and Syntax" [Всеволодова, Кукушкина, Поликарпов 2013; Канюшкевіч 2008-2010; Загнiтко та ін. 2007; Славянските 2007] have convinced us that grammaticalization is very active for Russian prepositional field. Therefore the purpose of the paper is to study paths and stages of grammaticalization (grammaticalization scale) within the field pointed out. The topic seems to be quite an actual problem not only theoretically as a grammaticalization process in Russian prepositional system description but for practical application as well – the results can be used in lexicography e. g. for dictionaries – new prepositional articles should be included. To achieve the objective it seems to be necessary to analyze Russian prepositional units in order to define their place on grammaticalization scale and to show the possible grammaticalization paths. Prepositions and units functioning as prepositions have also been an object of permanent Russian scholars’ interest. The eminent point for us is studies dealing with transition of words belonging to different parts of speech into prepositional units [Шереметьева 2008; Ши­га­нова 2001]. Nevertheless these papers don’t regard to grammaticalization itself, its paths and scales. c) decategorialization – loss in morphosyntactic properties characteristic of lexical or other less grammaticalized forms (for grammaticalization criteria relevant for Russian prepositional units see also [Всеволодова 2011]). Under the influence of these mechanisms new prepositions appear, e. g. in English: event (noun) à in the event of (preposition), head (noun) à ahead of (preposition), back (noun) à in the back of (preposition), respect (noun)à with respect to (preposition) etc. ; in Russian: течение (noun, ‘flow’, ‘course’) à в течение чего (preposition, ‘during’), следствие (noun, ‘consequence’) à вследствие чего (preposition, ‘in consequence off’, ‘owing to’), отличие (noun, ‘distinction’) à в отличие от чего (preposition, ‘in contrast to’, ‘unlike’), связь (noun, ‘bond’, ‘connection’) à в связи с чем (preposition, ‘because of’, ‘in view of’), подобие (noun, ‘resemblance’)à наподобие чего (preposition, ‘like’), путь (noun, ‘way’) à путем чего (preposition, ‘by’, ‘by means of’), etc. It’s well known that the sources of grammaticalization are usually presented by a restricted set of notions. Thus, demonstrative pronouns can develop into articles (German definite articles der, die, das), verbs of motion evolve into tense and aspect auxiliaries (English: to go à I am going to read a book (future tense auxiliary)), nouns expressing parts of body often become prepositions [Svorou 1994] (English: head à ahead of; Persian: bar ru-ye miz ‘on the table’, literally ‘on the face of table’) and so on (see above-mentioned papers of Ch. Lehman, P. J. Hopper, B. Heine, etc.). Therefore it seems reasonable to pay special attention to certain lexical groups while studying grammaticalization path "nounà preposition". So the target object for us is somatic nouns, or nouns expressing human body parts. Nevertheless we should admit that the Russian prepositional units in question unambiguously serving a grammatical function still have a morphosyntactic structure of their earlier uses as noun structures (перед лицом кого – ‘in the face of’, ‘in front of’, от лица кого – ‘on behalf of’, на глазах (у) кого – ‘in smb’s presence’, etc.). However, it appeared that such items express not only space meaning in Russian but become more and more abstract ("semantic bleaching") conveying relational and characterization senses. As far as prepositional system in Russian concerns we should mention that theoretical basis adopted here is the one of the project "Slavic Prepositions in Synchrony and Diachrony Aspects: Morphology and Syntax". It concerns with a very broad interpretation of prepositional units – for such are taken all units serving a grammatical function of preposition i. e. both proper prepositions (introducing functional parts of speech and having no other functions except for prepositional) and prepositional equivalents – units serving a grammatical function of preposition in certain contexts, but still representing notional words. 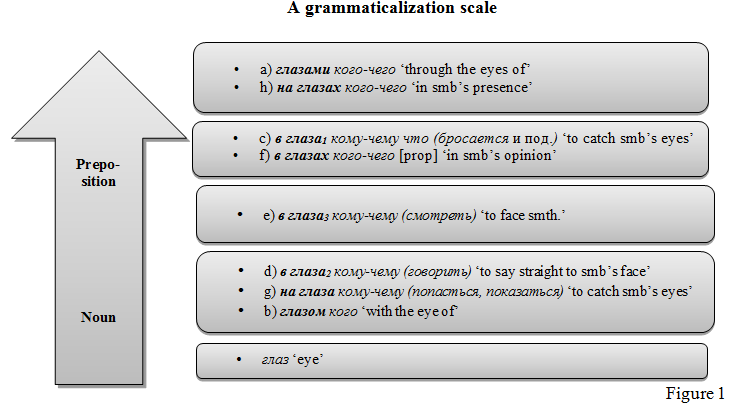 2) a grammaticalization scale of 8 prepositional units, including lexeme глаз ‘eye’. 1. A grammaticalization path "noun à preposition"
As it has been already noticed grammaticalization is inevitably bonded to desemantization , context generalization and decategorialization. Here we consider the grammaticalization path of the prepositional unit лицом к лицу с кем-чем (‘face to face with smb.-smth.’, ‘facing smb.-smth.’) starting with non-grammaticalized uses (ex. 1) further to the most grammaticalized (ex. 5). (5) книга Н. Хрущева «Лицом к лицу с Америкой» (‘N. Khrushchev’s book "America face to face"), with the independent use of the item лицом к лицу (‘face to face’), which elimination is unfeasible. As for the desemantization it’s quite obvious that the meaning develops from the space one in (1) to more abstract senses: (2) object, (3) state, (4) characterization, (5) relation. Exx. 1-5 represent thus a grammaticalization path involving desemantization , context generalization. Having acquired grammatical meaning this form tends to become increasingly divergent from its first uses: it loses in categorical properties characteristic of its first uses, hence undergoing decategorialization. We would like to emphasize that in the most grammaticalized contexts (exx. 3-5) the unit лицом к лицу c кем-чем (‘face to face with smb.-smth.’) serves as a proper preposition and deserves in our opinion a special dictionary article. h) на глазах кого-чего (‘in smb’s presence’). In order to define the grammaticalization degree of each unit we consider it profitable to view the following aspects: desematization, context generalization and decategorialization which reveals itself in the change of morphosyntactic paradigm. Россия глазами иностранцев (‘Russia thought the eyes of foreigners’). The sense of this structure is to be revealed as follows: ‘Иностранцы видят Россию следующим образом’ (‘Foreigners see Russian the next way’), so the prepositional unit serves to express the role of an Observer. The meaning and contexts develop generalization: реальность глазами Партии (‘the reality through the eyes of the Party’) à *глаза Партии (*’the Party’s eyes’). It’s eminent to note that the prepositional unit forms so called “free syntaxeme” – a word combination with prominent meaning independent of context which can be used separately (titles, headlines, etc. ): Глазами мента (‘Through the eyes of a cop’). Глазом художника он сразу отметил странные тени (‘Being an artist he has noted strange shadows at once’ lit. ‘with the eye of an artist he has notes strange shadows at once’). The unit expresses characteristics, the synonym is как (‘as’). In our opinion глазом кого (‘with the eye of’) is a potential preposition since no signs confirming grammaticalization has been revealed. Беспорядок бросился гостям в глаза (‘The mess caught the guests’ eyes’). The prepositional unit conveys the Protagonist role: ‘Гости увидели беспорядок’ (‘The guests saw the mess’) and forms “a determined syntaxeme” being used only within the structure <Nnom бросается в глаза N dative/genitive>. It serves an important communicative function – shades the Protagonist and illuminates the Object, making the latter syntactic, or grammatical subject. В глаза1 кому-чему (бросаться) (‘to catch smb’s eyes’) represents a highly grammaticalized item: Зарубежным фирмам бросается в глаза бюрократия (‘The bureaucracy catches the eyes of foreign companies’) – *глаза зарубежных фирм (‘*the eyes of foreign companies’). The propositional unit obtains a morphosyntactic paradigm irrelevant for the noun: в глаза кому-чему (Ndative) – в глаза кого-чего (Ngenitive): Беспорядок бросился в глаза гостям (dative case) – Беспорядок бросился в глаза гостей (genitive case) (‘The mess caught the guests’ eyes’). Генерал сказал правду в глаза правительству (‘The general said the truth straight to the government’ lit. ‘to the eyes of the government’). Being used solely after verbs of speech the prepositional unit is assumed to form “a bond syntaxeme”. The bond syntaxemes usually are observed to be less grammaticalized and have less generalization: сказать правду в глаза мужу (‘to say the truth straight to the husband’s face’ lit. ‘to the husband’s eyes’) – глаза мужа (the husband’s eyes), though some desemantization contexts are detected: в глаза правительству (‘to the eyes of the government’) – *глаза правительства (‘*the eyes of government’). The prepositional unit displays a morphosyntactic paradigm: в глаза кому-чему (Ndative) – в глаза кого-чего (Ngenitive): Генерал сказал правду в глаза правительству (dative case) – Генерал сказал правду в глаза правительства (genitive case) (‘The general said the truth straight to the government’ lit. ‘to the eyes of the government’). Нужно смотреть правде в глаза (‘One should face the truth’, lit. ‘watch the truth’s eyes’). The construction including the prepositional unit forms “a bonded syntaxeme” used strictly after verbs like смотреть (‘to watch’) and so on. Unlike most bonded syntaxemes the meaning and contexts are highly generalized: смотреть в глаза правде (lit. ‘to watch the truth’s eyes’) – *глаза правды (*’the truth’s eyes’). The meaning of the construction (‘One should realize the truth’) has nothing in common with the semes constituting the lexeme глаз (‘eye’). The morphosyntactic paradigm is peculiar to the unit: в глаза кому-чему (Ndative) – в глаза кого-чего (Ngenitive): Нужно смотреть в глаза правде (dative case) – Нужно смотреть в глаза правды (genitive case) (‘One should face the truth’, lit. ‘watch the truth’s eyes’). В глазах матери Вася еще дитя (‘In his mother’s opinion Vasya is still a baby’). The prepositional unit obtains the same meaning indicating an Observer as (а) глазами кого-чего (‘through the eyes of’) but its syntactic behavior restrains us to assume them synonyms. The point is that (f) в глазах кого-чего [prop] (‘in smb’s opinion’) requires 2 propositions, forming therefore “a determined syntaxeme” – the item with the meaning clarified only in definite construction. The first obligatory proposition indicates the Observer: Мама считает (‘The mother considers’) and the second one expresses characteristics: Вася еще дитя (‘Vasya is still a baby’). On the contrary the second proposition is never attached within one sentence to (a) глазами кого-чего (‘through the eyes of’). The preposition tends to be highly grammaticalized: в глазах общественности (‘in public opinion’, lit. ‘in the eyes of community’) – *глаза общественности (*’the eyes of community’). The unit forms “a determined syntaxeme” and appears within 2 structures: (1) Эта газета случайно попалась на глаза жене (‘My wife saw the newspaper by accident’ lit. ‘The newspaper caught my wife’s eyes accidentally’); (2) Он не хочет показываться на глаза боссу (‘He doesn’t want to be seen by the boss’ lit. ‘He doesn’t want to show up in the boss’s eyes’). No grammaticalization traces has been found for the unit except for morphosyntactic paradigm: на глаза кому-чему (Ndative) – на глаза кого-чего (Ngenitive): (1) Эта газета случайно попалась на глаза жене (dative case) / жены (genitive case) (‘My wife saw the newspaper by accident’ lit. ‘The newspaper caught my wife’s eyes accidentally’); (2) Он не хочет показываться на глаза боссу (dative case) / босса (genitive case) (‘He doesn’t want to be seen by the boss’ lit. ‘He doesn’t want to show up in the boss’s eyes’). Это происходит на глазах всего мира (‘This is witnessed by the whole world’ lit. ‘It is happening on the eyes of the whole world’). The unit functionally serves for the Observer role: Весь мир видит это (‘The whole world witnesses it’) and is assumed to be highly grammaticalized (desematicization and context generalization): на глазах всего мира (lit. ‘on the eyes of the whole world’) – *глаза всего мира (‘*the eyes of the whole world’), constituting moreover a morphosyntactic paradigm: на глазах кого-чего – на глазах у кого-чего: Это происходит на глазах всего мира – Это происходит на глазах у всего мира (‘This is witnessed by the whole world’ lit. ‘It is happening on the eyes of the whole world’). The summarized data for the discussed prepositional units are presented in the table 1. On the basis of table 1 we can design agrammaticalization scale for the prepositional units including lexeme глаз ‘eye’ (Fig. 1.). Thus, we suppose that the prepositional units (a) глазами кого-чего ‘through the eyes of smb.’, (h) на глазах кого-чего ‘in smb’s presence’, (c) в глаза1 кому-чему что (бросается и под.) ‘to catch smb’s eyes’, (f) в глазах кого-чего [prop] ‘in smb’s opinion’ have completed their grammaticalization and become prepositions. We suggest them to be worthy of having a separate articles in the dictionaries taking into consideration their only possible interpretation within prepositional construction. The prepositional unit (e) в глаза3 кому-чему (смотреть) ‘to face smth’ is on its way to prepositions and (d) в глаза2 кому-чему (говорить) ‘to say straight to smb’s face’, (g) на глаза кому-чему (попасться, показаться) ‘to catch smb’s eyes’, (b) глазом кого ‘with the eye of smb’ have just started the grammaticalization and still are settled within the noun field. Here we summarize our conclusions with regard to its theoretical and practical implications. First of all, it has been pointed out that grammaticalization process is very active in Russian within prepositional system. We expect to find the same process in other semantic groups especially in the ones of somatic nouns. The conclusion can be transferred to Russian prepositions as a category – it is assumed to be a very rapidly replenished class. Second, on the basis of one grammaticalization path discussed in the paper we can identify the grammaticalization channels peculiar to prepositional unit and enlighten the active process in the sphere which is very significant for drawing attention to the considerable changes in Russian prepositions as a category. Third, our study has identified the grammaticalization level of 8 prepositional units in Russian language which allowed us to construct a grammaticalization scale for these units. It offers a great potential for analysis and synthesis of the items in question. The material of the paper thus has implications for Russian language as foreign studying, machine translation and lexicography practice. As far as our future research concerns we should mention the following tasks: a) a thorough study and description of Russian prepositional units, particularly the ones including somatic nouns; b) determination of their grammaticalization level in view of proper lexicographic interpretation; c) revealing and providing extra reliable means for distinguishing the grammaticalization stages. The last grammaticalization mechanism – erosion (or "phonetic reduction" – loss in phonetic substance) has not yet been revealed for Russian prepositions. V. Podlesskaya and E. Rakhilina remind us that the most widely spread model of space orientation is a human body part model: an object is identified by its place and form to human body, then it is oriented similarly to human body orientation. It is significant that different languages prefer for these purposes different parts of body [Подлесская, Рахилина 2000]. And other Slavic languages as well, see e. g. [Конюшкевич 2010; Виноградова, Чекалина 2013]. Виноградова, Чекалина 2013: Виноградова, Е.Н., Чекалина, В.Л. Такие разные глаза… Предложные единицы, включающие лексему глаз/глаза (зарисовки на материале славянских языков) [Текст] / Е. Н. Виноградова, В. Л. Чекалина // Язык, сознание, коммуникация : сб. статей. – Выпуск 47 / Ред. кол. : М. Л. Ремнёва и др. – М. : МАКС Пресс, 2013. – С. 103-122. – Библиогр. : с. 120-122. Всеволодова 2011: Всеволодова, М.В. К вопросу об операциональных методах категоризации предложных единиц [Текст] / М. В. Всеволодова // Вестник Московского университета. Серия 9. Филология. – 2011. – № 2. – С. 103-135. – Библиогр. : с. 134-135. Всеволодова, Кукушкина, Поликарпов 2013: Всеволодова, М.В., Кукушкина, О.В., Поликарпов, А.А. Русские предлоги и средства предложного типа. Материалы к функционально-грамматическому описанию реального употребления : Введение в объективную грамматику и лексикографию русских предложных единиц. Кн. 1 [Текст] / М. В. Всеволодова, О. В. Кукушкина, А. А. Поликарпов. – М. : Изд‑во «Едиториал УРСС», 2013. – 304 с. – Библиогр. : с. 291-302. – ISBN 978-5-397-03585-9. Загнiтко та ін. 2007: Загнітко, А.П. Словник українських прийменників [Текст] / А. П. Загнітко, І. Г. Данилюк, Г. В. Ситар, І. А. Щукіна. – Донецьк : ТОВ ВКФ «БАО», 2007. – 416 с. – 15000 пр. – ISBN 966-338-552-9. Канюшкевiч 2008-2010: Канюшкевiч, М.I. Беларускiя прыназоўнкi i iх аналагi. Граматыка рэальнага ўжывання. Матэрыялы да слоўнiка [Текст] / М. I. Канюшкевiч. У 3 ч. – Гродна : ГрДУ, 2008-2010. – 300 экз. – ISBN 978-985-515-024-5, 978-985-515-022-1. Конюшкевич 2010: Конюшкевич, М.И. Соматизмы в функции предлога (К вопросу о границах категории персональности) [Текст] / М. И. Конюшкевич // Лінгвістичні студії : Зб. наук. праць. – Випуск 20 / Укл. : Анатолій Загнітко (наук. ред.) та ін. – Донецьк : ДонНУ, 2010. – С. 79-86. – Библиогр. : с. 86. Подлесская, Рахилина 2000: Подлесская, В.И., Рахилина, Е.В. «Лицом к лицу» [Текст] / В. И. Подлесская, Е. В. Рахилина // Логический анализ языка : Языки пространств / Н. Д. Арутюнова, И. Б. Левонтина (ред.). – М. : «Языки русской культуры», 2000. – С. 98-107. – Библиогр. : с. 106-107. – ISBN 5-7859-0174-9. Славянските 2007: Славянските предлози [Текст]. – Велико Търново : Изд. ИВИС, 2007. – 199 с. – Литература е в краят на разделите. – ISBN 978-954-8387-04-0. Шереметьева 2008: Шереметьева, Е.С. Отыменные релятивы современного русского языка. Семантико-синтаксические этюды [Текст] / Е.С. Шереметьева. – Владивосток : Изд‑во Дальневосточного ун‑та, 2008. – Библиогр. : c. 227-233. – 236 с. – ISBN 978-5-7444-2051-2. Шиганова 2001: Шиганова, Г.А. Система лексических и фразеологических предлогов в современном русском языке [Текст] : дис. … д-ра фiлол. наук : 10.02.01 / Шиганова Галина Александровна ; научн. конс. А.М. Чепасова ; Челябинский государственный педагогический университет. – Челябинск, 2001. – 612 с.
Heine, Kuteva 2002: Heine, B., Kuteva, T. World lexicon of grammaticalization [Text] / B. Heine, T. Kuteva. – Cambridge : Cambridge University Press, 2002. – 389 pp. – Ref. : Pp. 351-387. – ISBN 978-0-521-00597-3. Hopper, Traugott 2003: Hopper, P.J., Traugott, E.C. Grammaticalization (second edition) [Text] / P. J. Hopper, E. C. Traugott. – Cambridge : Cambridge University Press, 2003. – 276 pp. – Ref. : Pp. 237-264. – ISBN 978-0-521-80421-3. Lehmann 2002: Lehmann, Ch. Thoughts on grammaticalization : a programmatic sketch (second edition) [Text] / Ch. Lehmann // Arbeitspapiere des Seminars für Sprachwissenschaft der Universität Erfurt (Heft 9). – Erfurt : Seminar für Sprachwissenschaft der Universität, 2002. – 171 pp. – Ref. : Pp. 162-171. – ISSN 1612-0612. Svorou 1993: Svorou, S. The grammar of space (Typological studies in language : Vol. 25) [Text] / S. Svorou. – Amsterdam : John Benjamins, 1994. – 290 pp. – Ref. : Pp. 263-278. – ISBN 90 272 2911 2. Статтю присвячено вивченню процесу граматикалізації у прийменниковій системі російської мови. Особливу увагу приділено реконструкції шляхів граматикалізації «іменникà прийменник» (на прикладі прийменникової одиниці лицом к лицу с кем-чем) і побудові шкали граматикалізації для 8 прийменникових одиниць, що містять соматизм глаз, за ступенем їх граматикалізації. Ключові слова: граматикалізація, шлях граматикалізації, шкала граматикалізації, російський прийменник, прийменникова одиниця, соматизм.